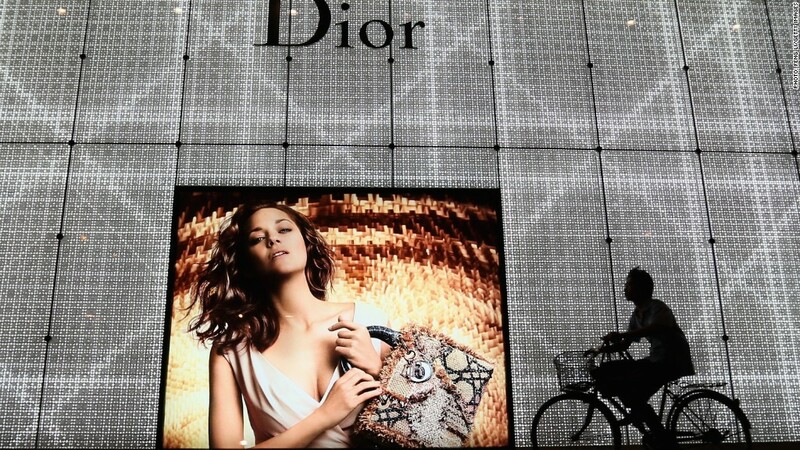 A Chinese man rides bicycle past an advertisement for Christian Dior in Beijing. Chinese consumers are tightening their grip on the luxury goods market. An estimated 25% of the world's luxury purchases are now made by Chinese nationals -- a five-fold increase from 5% in 2007, according to a new report from global bank HSBC. "We do not think China's luxury sector is even close to being mature," the analysts write. "China remains above all a market where brands are recruiting customers rather than serving repeat ones." One factor powering growth is the expansion by retailers from China's leading metro areas to smaller cities and regional hubs -- a trend that means luxury shops are opening for the first time in cities with populations nonetheless as large as Paris or San Francisco. Cultural factors are also at work. Following the trajectory of other developed nations, members of China's rapidly expanding middle and upper classes feel an "urge to splurge." "While awareness levels are still low for some brands and penetration in second-tier cities limited, the ultra-rich of China are already spending more on luxury items than their Western counterparts," the authors write. Yet potential stumbling blocks remain. Chinese consumers are becoming more sophisticated, and their motivations for purchasing luxury goods are complicated. Younger consumers are more value conscious than the older generation, and buying patterns suggest less of an emphasis is being placed on logo-driven designs, according to HSBC. At present, Chinese nationals do much of their shopping outside mainland China, where tax advantages and currency swings can drive prices down. Buyers making purchases outside China often face a lower value-added tax, while consumption and import taxes are skirted as well. Indeed, only about 10% of luxury sales are made in China -- but Chinese nationals account for 25% of luxury retailers' global revenue. Lower taxes aren't the only reason for the out-of-country buying trend. In-store service is often higher quality in established luxury markets, and counterfeit goods are not as prevalent. In addition, travel to exotic destinations by China's upper class is increasing, allowing for more holiday indulgences. In Australia, for example, visitors from China spend an average of $3,000, compared to only $1,000 for American and European tourists, according to HSBC. The report also cites concerns over the widening wealth gap between top earners in China and the poor. "In a country which is still struggling with relatively low average GDP per capita, social tension is rising between the have and have-nots," the analysts write. "Social unrest has become a possibility and people making ostentatious displays of their wealth and social status risk angering those less well-off."